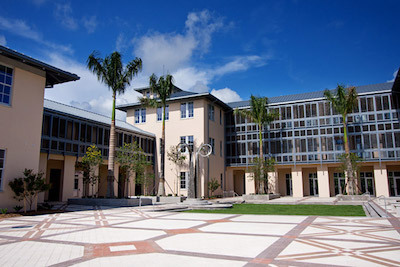 Just to the left of the Ringling Museum of Art, the Mildred Sainer Music and Arts Pavilion is the centerpiece of New College’s Caples Fine Arts Complex, a haven for student artists and performers. The acoustic perfection of a concert hall combines with the intimacy of a private music chamber to create a 257-seat auditorium (260 with 3 wheelchair positions) that is perfect for solo or duo recital, small instrumental groups, lectures and small dramatic productions. The lobby doubles as a reception area and a visual arts exhibition area where art works can be displayed. Free parking is available in front of the building and along Caples Drive in the grass on the left hand side of the road. Patrons may be dropped off under the portico. Accessible parking spaces are to the right of the building. To the rear of the Mildred Sainer Pavilion is the PepsiCo Arcade and Forum, designed with reference to the Mediterranean Revival Style of nearby Caples Hall. The forum’s large grassy area serves as a private outdoor space away from the hustle and bustle of everyday life. 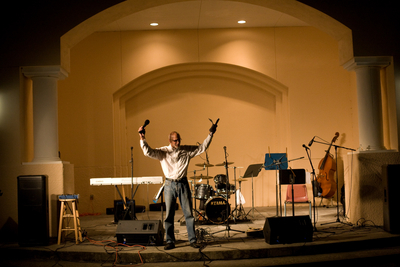 A small stage overlooking the courtyard provides an ideal place for performances and receptions. Free parking is available in front of the Mildred Sainer Pavilion and along Caples Drive in the grass on the left hand side of the road. Accessible parking spaces are to the right of the Mildred Sainer Pavilion, and sidewalks connect to the Arcade itself. Built in 1926 by Charles Ringling of the Ringling Brothers Circus, College Hall is the signature building on the New College campus. The Music Room is to the left of the main Living Room, down some stairs. Ramp access is on the left side of the building. There is ramp access to the Living Room (via the Patio) by going around the building to the left and continuing to the back. Free parking is available in front of College Hall. Accessible parking spaces are close the the building on the left-hand side. 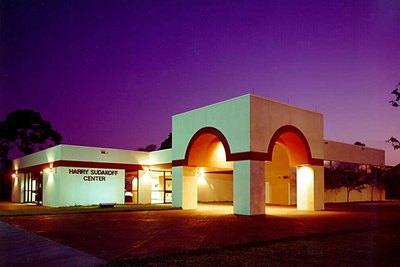 The Harry Sudakoff Conference Center is just east of US41 off General Spaatz Blvd. The main parking lot is often filled with students' cars, but there is overflow parking on the left of General Spaatz Blvd.—follow the sign that says, "Sudakoff North—Event Parking." For concerts we usually have a tram staffed by friendly New College students to shuttle you to and from the entrance. Accessible parking is in the main lot, on the right side, close to the Conference Center. 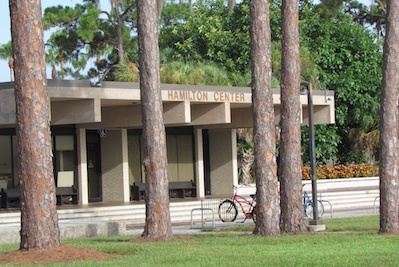 The Black Box Theater is inside Hamilton Center, to the left of the Sudakoff Conference Center and across the plaza. Parking is the same as for Sudakoff (see above). 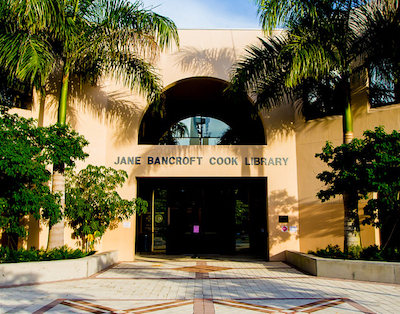 New College's Jane Bancroft Cook Library is on Bay Shore Road, just south of College Drive. There are a few accessible parking spaces on the other side of Bay Shore Road, in the first lot off College Drive; otherwise please park in the shell lot north of College Drive on the west side of the street. Facing the Library on Bay Shore Road is the ACE (Academic Center) Building, with the Koski Plaza and its sculpted bell tower in between. There are a few accessible parking spaces on the other side of Bay Shore Road, in the first lot off College Drive; otherwise please park in the shell lots north of College Drive.